The following information was posted on this site following Jack Gibbons miraculous survival of a near-fatal auto accident in March 2001, beginning with a newspaper report from the Oxford Mail, followed by three updates on his condition, including news of the fund-raising concert he gave in March 2002 for the hospital that treated him. At the bottom of the page are X ray photographs showing the skill of the John Radcliffe Hospital surgeons in repairing his left arm. A gifted pianist is rebuilding his career after narrowly cheating death in a car crash. Jack Gibbons, who first dazzled concert audiences in Oxford when he was just 15, is trying to regain movement in his left arm which was badly smashed in a head-on collision at Hopcroft's Holt near Steeple Aston. Mr Gibbons, 39, was trapped in wreckage for almost an hour before fire-fighters cut him free. Surgeons at the John Radcliffe Hospital, Oxford, removed his spleen and operated on other injuries including a punctured lung, broken sternum and ribs, and smashed jaw and cheek bones. He was in intensive care for three days. His older brother, Tom, who is vicar of Radley, near Abingdon, said it was a miracle he had survived the crash. "If you had seen the car, you would never have believed anyone could have got out alive," he said. "The fact that he has the movement he has is a tribute to the doctors and staff. When the accident happened, Mr Gibbons was returning from visiting family in Wales to his home in Oxfordshire which he shares with his wife, Diana, who is also his manager. Two other men suffered minor injuries in the crash. Mr Gibbons, who is now out of bed and has some movement in his left arm, was showing "steely determination" to regain full use of the limb, his brother said. He said: "He knows it will be a long haul, but he's setting himself exercises. He has some sideways movement of his elbow and can move his fingers as if he's playing the piano. The major thing is to get his hand and fingers working again and keep encouraging him. But to have got to the stage he's at just a week after a near-fatal accident is quite remarkable. "We'll certainly hear him playing again, I'm sure of that. Nothing surprises me about Jack, he's such a strong spirit." Mr Gibbons is considered to be one of the world's leading performers of the works of Gershwin. In response to many requests from fans around the world we are happy to report that Jack Gibbons is continuing to make a remarkable recovery following his involvement in a serious auto accident at the beginning of March. Now out of hospital Jack's movements are still restricted due to two broken feet, in addition to the severe fracture of his left elbow, and fractures to his ribs, sternum and face. As many British TV viewers would have seen in a recent BBC interview, which he gave to reporters on March 26th, Jack already has his famous smile back, and is working hard to regain strength and mobility in his left hand. Although his concert engagements have been cancelled for the next 6 months, doctors see no reason why, with patience and determination, he shouldn't regain the extra-ordinary skill in his left hand that enabled him to perform Gershwin's remarkably acrobatic left hand stride bass. After the above information was posted on this web site Jack had to be re-admitted to hospital for further life-saving emergency surgery, performed by Dr Mainprize and Professor Mortensen at the John Radcliffe Hospital in Oxford. However since this set-back he has continued to make a remarkable recovery, and only four weeks after being discharged from hospital for the second time he performed in Oxford on the evening of May 26th as part of a concert by the City of Oxford Orchestra; sitting at the piano in his wheelchair Jack played a collection of solo piano pieces that he had especially arranged for the right hand alone (his left hand still being incapacitated), including Preludes by Bach and Chopin, a song by Hoagie Carmichael, an extract from Rachmaninov's Second Piano Concerto, and Gershwin's Our Love Is Here To Stay. 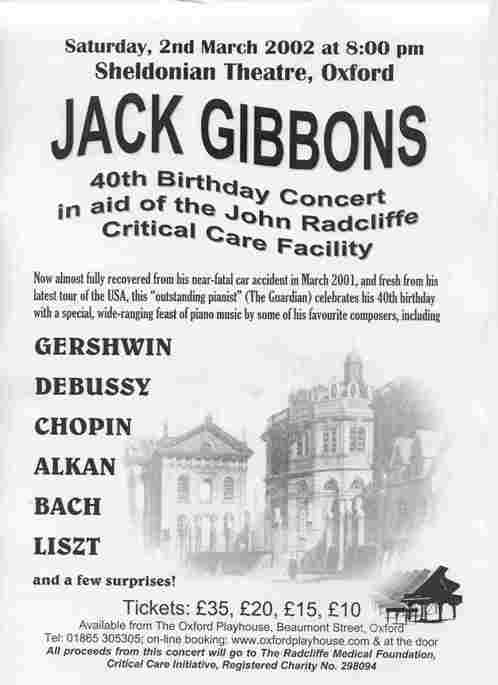 On March 2nd 2002, Jack Gibbons celebrated his 40th birthday by giving a very special concert in aid of the John Radcliffe Hospital's Critical Care Initiative as a way of thanking the staff of the hospital for saving his life and enabling him to resume his career so soon after the accident. The concert took place in Wren's famous Sheldonian Theatre, built 1664-8, and one of Oxford's most impressive university buildings. Details of the money raised will be posted on this site. Meanwhile you can read a review of the concert, published in the Oxford Times on March 8th 2002, by visiting the press room. On the right are two X ray shots of Jack Gibbons' left arm, showing the wonder of modern medicine. 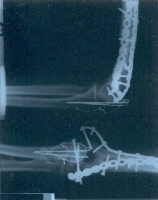 Surgeon Phil Wilde of the John Radcliffe Hospital in Oxford repaired the arm which had broken into 15 pieces. He later said mending it was rather like putting together a jig-saw puzzle! Jack came millimetres away from having his ulna nerve completely severed, which, with the resultant loss of use of the fingers of his left hand, would have meant the end of his piano-playing career.